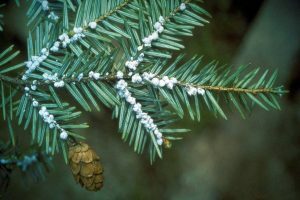 Wooly Adelgids are attacking hemlock trees, causing widespread death and decline across the eastern US. The beautiful hemlocks in Bobby Davis Park are infected. But this infestation can be treated! Join the Perry County Kentucky Conservation District and the Kentucky Division of Forestry for a hands-on workshop to learn how to recognize and treat wooly adelgids.